Examples, solutions, videos, and lessons to help Grade 8 students learn how to interpret the equation y = mx + b as defining a linear function, whose graph is a straight line; give examples of functions that are not linear. For example, the function A = s2 giving the area of a square as a function of its side length is not linear because its graph contains the points (1,1), (2,4) and (3,9), which are not on a straight line. I can recognize that a linear function is graphed as a straight line represented as an equation in the form y = mx + b.
I can provide examples of nonlinear functions using multiple representations (tables, graphs, and equations). I can compare the characteristics of linear and nonlinear functions using various representations. The following table shows how to represent functions using graphs, equations, verbal explanations, and tables. Scroll down the page for more examples and solutions. How can you tell if a function is linear? • Graph is a straight line. Examples of linear, exponential and quadratic functions. 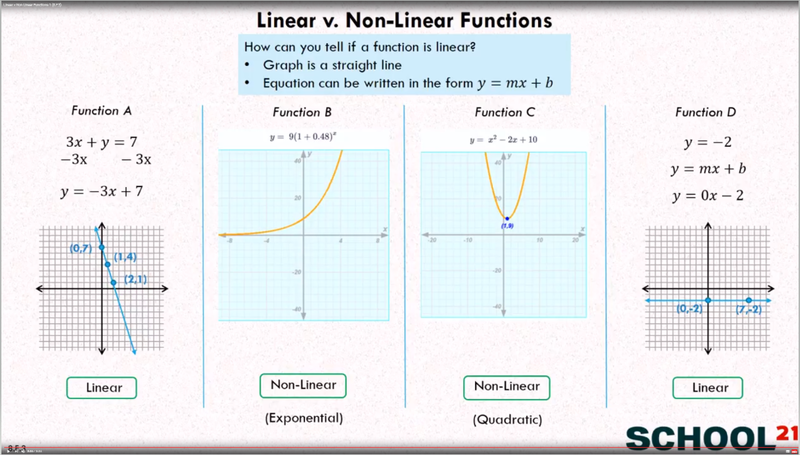 In this common core example, we look at non linear functions through the structure of an equation, table and graph. Identify functions using tables, graphs or equation.